Balayage highlights are one of the hottest hair color trends of today. 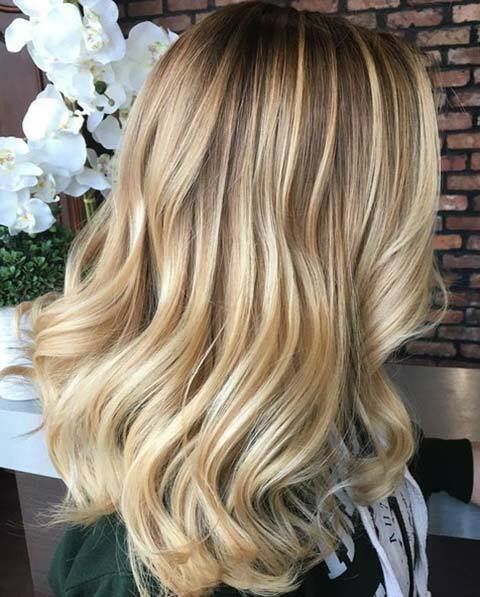 You’ll find it to be one of the most requested styles in salons, and it is a technique many celebrities employ to keep their hair looking fresh and natural, while still being able to rock the forever-loved highlights look. 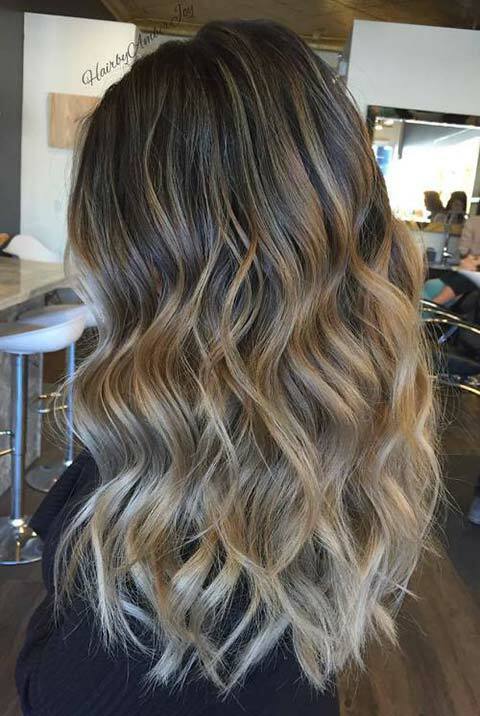 As such, it’s becoming more and more popular for women everywhere to ask for balayage highlights at their next salon appointments, and it might be something you should consider too. 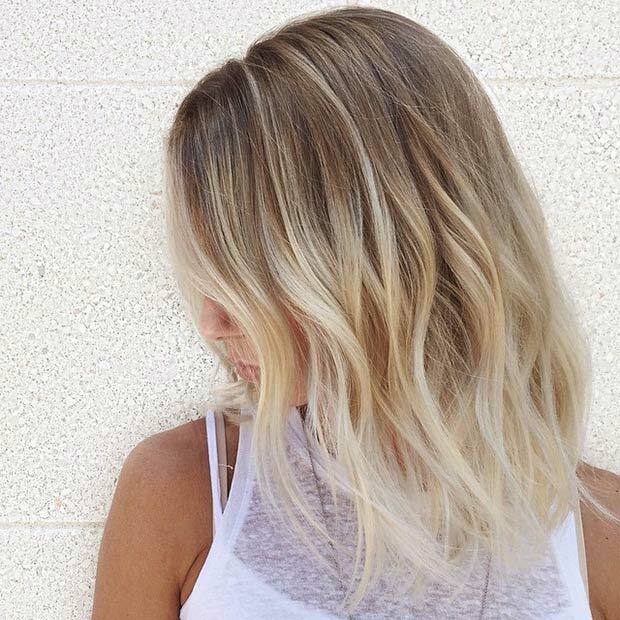 In order to help you make your decision, we have compiled a list of 15 stunning balayage hair colors with blonde highlights. Braids of any type are even more stunning when you have balayage highlights. 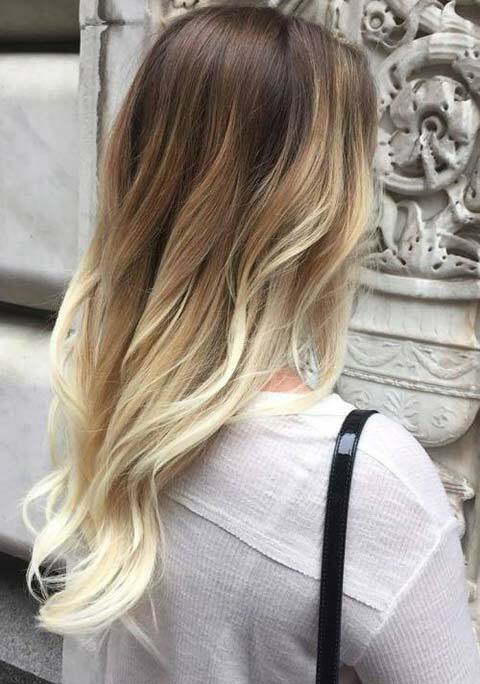 Balayage colored hair with blonde highlights is more natural than other forms of highlighting, and looks smoother when strands are braided together. This look can be more casual or dressed up, depending on what you feel like wearing. Either way, you’re bound to look lovely, especially with your smooth balayage hair. This is a simpler look that does an exceptional job at showcasing the balayage hair color. As you curl your hair, the colors separate to create a beautiful mingling of styles. The short length is perfect to go along with the bouncy spring/summer breezes, so you can wear anything from your favorite sundress to a pair of denim shorts and sandals. You’ll be ready for anything, especially as the natural balayage blonde highlights are able to shine. 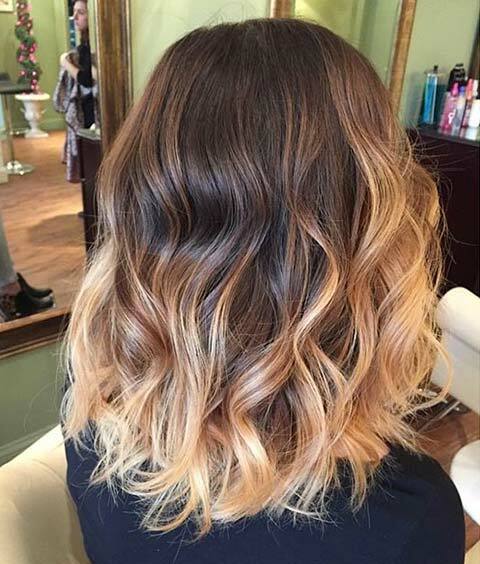 This balayage colored look creates an ombre effect, by starting with a dark brown on top and moving into the blonde highlights at the tips. It is another easy-to-create look, making it ideal for everyday use. 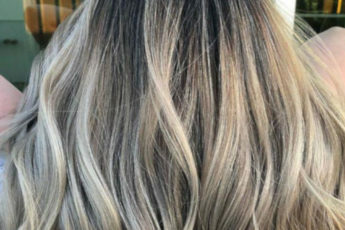 As always, the balayage blonde highlights will look stunning under the summer sun, yet this particular style isn’t as seasonal as the past wavy look. So no matter when you want to try this look out, you can style it with ease. 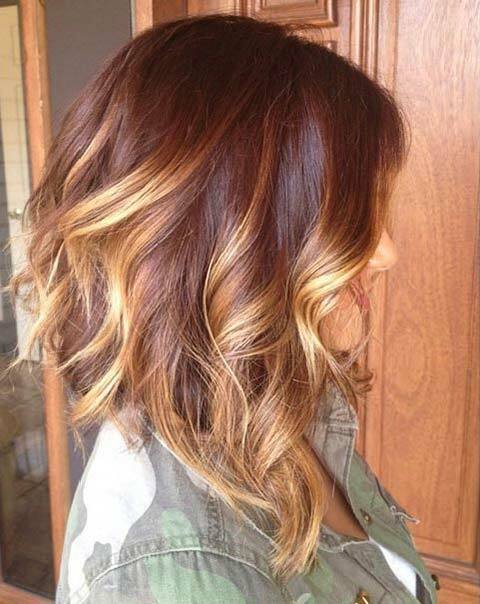 This is another short balayage-colored hairstyle perfect for summer. Between the cascading highlights and stacked cut, the hairstyle would be lacking if it weren’t paired with a cute dress or some denim. But beware, with the short waves at the back of the head mixing with the summer sun: you’ll need to make sure you have just enough product to prevent frizzy flyaways from ruining your look. Balayage hair color isn’t always about bright highlights, especially if your intended goal is a natural glow. Here is a lovely style of long hair, with colors that don’t contrast one another, but rather flow into each other. You can still see where the balayage highlights begin, but it seems like an easy move from one to the next. You don’t have to worry too much with this style, and its simple prettiness makes it fit for dressing up or down; it’s your call! Don’t be afraid to let your hair down; with balayage-colored hair, an ombre effect on longer hair is perhaps more striking than it is on shorter hair. You can leave it as is, or simply pull it into a loose ponytail for a look that can be worn with whatever you like. This is one style you can dress up or down, without having to worry about creating intricate braids or other details. This look is a twist on the classic bleach-blonde hairstyle. With this balayage structured hair, you don’t have to worry about your roots showing, as they are essentially a part of the design. If you have naturally dark hair, this works to your advantage, especially if you’ve been leery to try out frosty blonde hair. It’s hard for some women to imagine taking the risk of their natural color shining through, so this style gives everyone the option to try out something new for a fun summer look. It’s hard to look at a Victoria’s Secret model and not feel a little bit jealous of her bouncing hair, and this style gives you a way to create that hair moment for yourself. 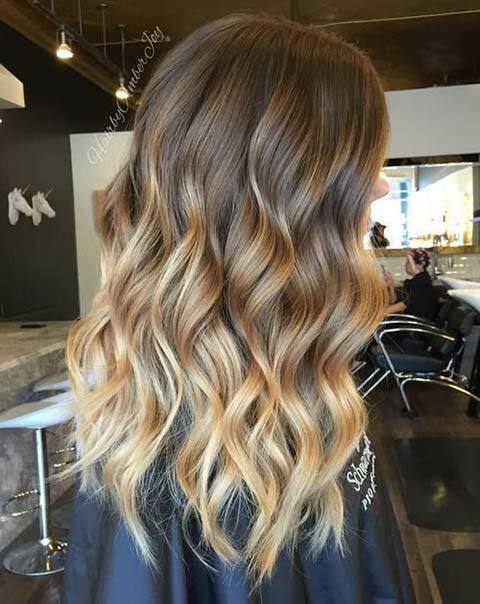 Your long, luscious locks will be shining with the balayage caramel color, and the waves will give you that flounce you’ve always wanted. The caramel blends into a darker brown, so the highlights appear natural, and sun kissed. It will look lovely down, or up in a loose pony if you want it away from your body. Here is a casually chic look that you can use any time of year. 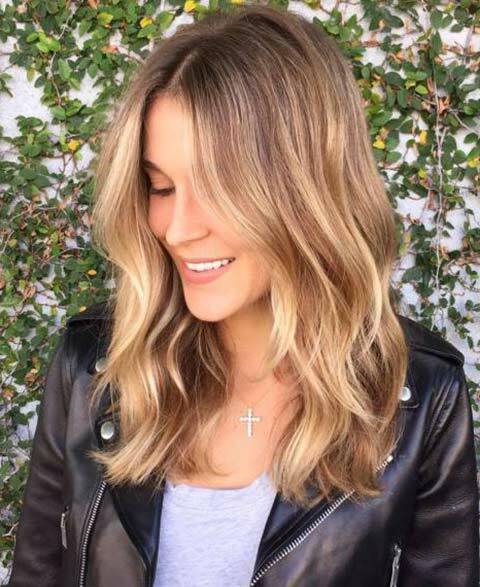 Flowing from a light brown to blonde, you’ll be able to pair this hairstyle with your favorite garments, like a moto jacket and skinnies, for instance. This is one look you won’t be able to dress up without some additional styling, but with how easy it is to style for everyday wear, you’ll be good to go for a better part of the year. This look vibrantly contrasts a lovely brown with a nearly-white blonde. The partial wave of the hairstyle is appealing, as it doesn’t seem overthought. There isn’t much to the overall styling process, so you can let your balayage hair color be the star. As it transitions via a slow ombre, you see the deep brown lighten a bit before being contrasted heavily against the blonde ” your hair will be speaking volumes for you, so you don’t have to spend as much time styling it to say your piece. 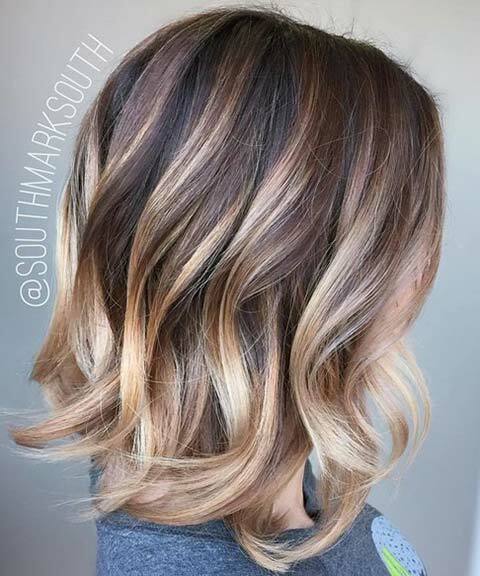 This is an overall look you might recognize from awhile back, but now with the addition of balayage coloring it appears to be smoother and more natural. This is an especially casual look, as it would seem right at home on a day out to the beach. The brown to blonde styling can be disheveled without seeming unintentional, so it is particularly manageable for the woman on the go. 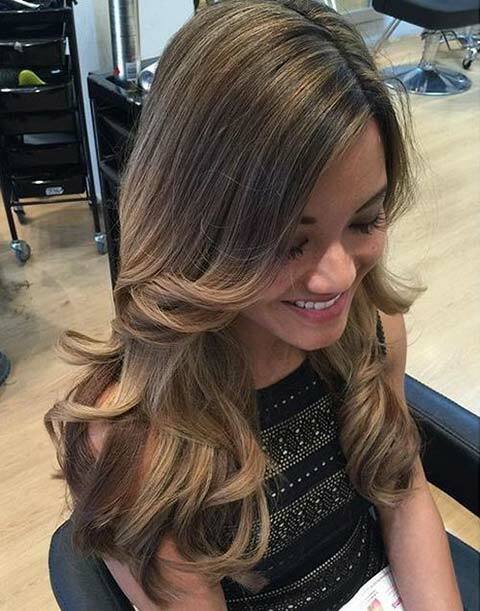 This balayage highlighted look has blonde highlights intermingling with thick brown strands. This is a take on a commonly found look, and with the freehand highlights they can be better integrated into the whole hairstyle. And since it’s a bob, it’s another look that will look cute with a summer dress or strappy top ” or anything else, for that matter! Balayage hair can bring out the best in blonde hair, particularly because it takes out the concern of showing roots. This look has a lot of volume that will give you an edge as you walk down the street in your favorite summer looks. The dark brown near the scalp only makes the blonde more vibrant, so between the color, the naturalness of the balayage highlighting, and the volume, you’re all set for a winner of a look. Think Jessica Rabbit with balayage hair ” just take away a bit of the volume in the bangs and replace it with this gorgeous, smooth, nearly white shade. Taken all to one side, this hairstyle can add a great deal of sensuality to any look you wear, any time. This shade of blonde is striking, especially when it’s styled in such a way that embodies the sexual empowerment women can have. 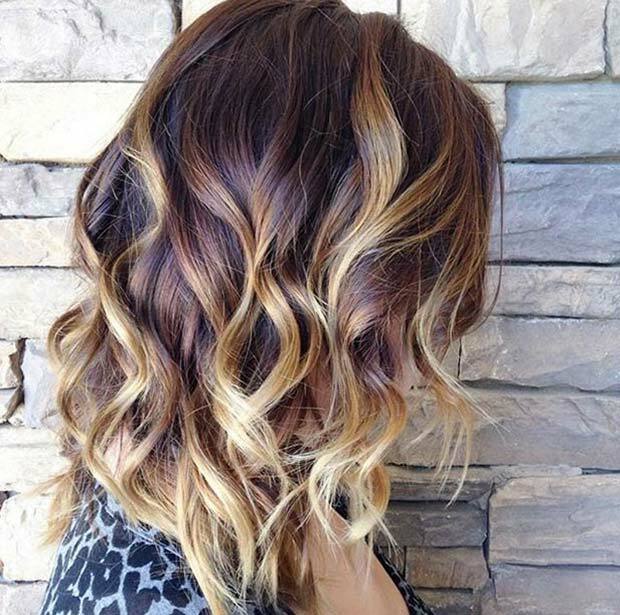 Summertime is the ideal time to let that part of you loose for a day out, and balayage colored hair gives you that perfect moment. There’s nothing cuter than wavy hair, and there’s nothing too striking about this look, other than the smoothness provided by the natural balayage highlights. 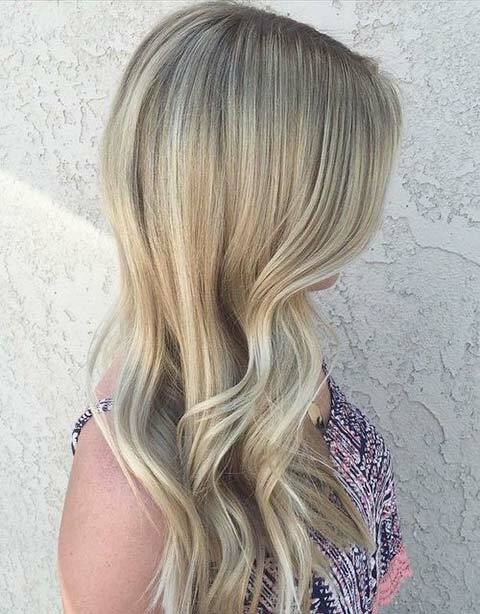 This hairstyle would look stunning all year long, and it could be styled for just spring/summer because of the way it transitions from deep brown to dirty blonde. By flipping the blondes with their waves, it adds a cute level of femininity that reminds of classically wavy hair, while still keeping things modern and fun.